The wedding day needs a lot of planning, or it will create a real havoc. You need lots of preparations to make sure there is no issue on the big day. Here are a few tips to help you out. Here are a few important accessories that need due importance. Bindi symbol on Forehead: This is one accessory with which you can experiment as much as you wish. If you like the simple look, get something elegant but noticeable to adorn your forehead. 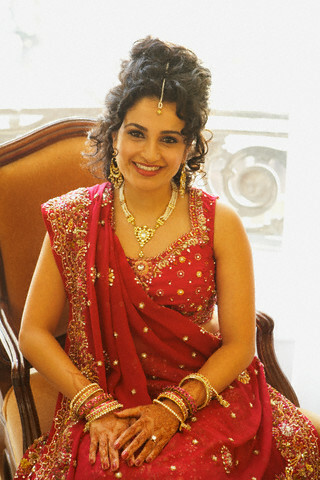 For people who like the dramatic look, there are several artistic and stylish bindis available. You can use a bindi as complicated as you wish. You just need to keep in mind your forehead makeup style and also the size of your forehead. Get a good bindi that compliments your look and style. Hair Accessories: Here, you have a choice between hair jewelry and flowers. You may even use both. Trying out your look before the wedding day, with complete makeup is a good idea to make sure it suits you well. Hands and Feet: This is another important part of your look for the special day. 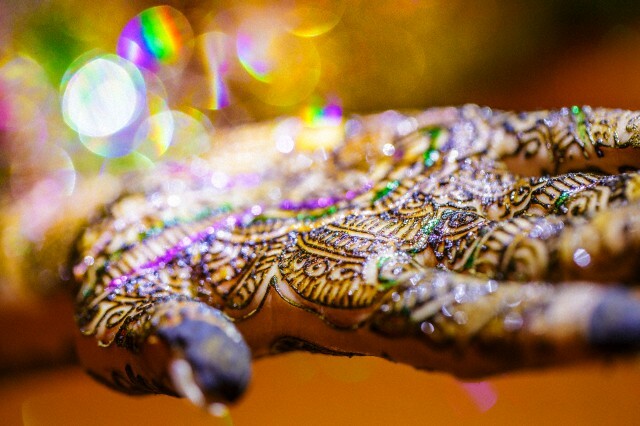 The way to adorn your hand and feet depends on which part of India you come from. You may use either ‘mehndi’ or ‘alta’. Whatever you sue, it is a good idea to try it out at least a month and a half or 2 months before your wedding. This will let you know in case you have allergies or problems with usage. If you have any issues, you will have enough time to try other possible alternatives. You must do enough research to find out good designs that will match your look. Moreover, it must also be apt for your hands and feet too. Get a good designer to complete the designing. Make it simple and do not overdo. Trying to do this yourself is a big risk, so better do not go for it. In case you do not want to get a professional, you could as a friend to help you out. Do not experiment too much, and keep usage of colors to a minimum. Keep the look to be stunning, and not over dramatic. Before the big day, try on your wedding dress and experiment with your looks to get the perfect look ready. French manicure will need an hour to get ready, and a good professional to get the best look. Even if you get the artist ready, getting the time is the major problem. You can never expect to have lots of time to spare on your wedding day. Moreover, the haldi and mehendi ceremony could leave your nails stained, and spoil your perfect manicured nails. So, a better idea is to get your gold, silver, red, or maroon look. In such cases, getting a top coat will hide any stains on it. The classic look is elegant and also safe to use. Other Forehead Décor: You have the choice to use sandalwood paste drawings of various sizes to adorn your forehead. If you do not like the look, get some decorative bindis to use as a set. Whatever make up you use on your forehead should match with your bindi and be apt for your forehead size. For small foreheads, it is better not to use too much of makeup. It could overpower your entire look. Keep it elegant and pristine. Your forehead should not look too overcrowded. If you have a wide forehead, you can choose lots of options to use. Choose a purse that gels with your outfit on your wedding day. Do not go for something that is too tiny, because you may regret the decision later on. Get a good purse or ‘potli’ that is small, but has good capacity. It must be able to fit in your lipstick, kajal, compact, tissues, and most importantly, your phone. These are important things that you will need to carry around with you. This one accessory is never given the due importance. After the whole shopping is complete, this one thing is usually bought in haste. Before you pick up your shoes, do check out a few points, the most important being comfort. You do not want your feet to get sore after hours of standing on your wedding day. Any source of discomfort in your feet will spoil your mod for the entire day. A good idea is to limit the heels to just 2 inches, and never more. Avoid stilettos at any cost. Start practicing walking on your wedding shoes at least a week before your wedding this gives your feet the time to adjust. This is a part of big confusion and issues. The type of jewelry depends on your personal taste, your style, and most importantly, your attire. Facial structure plays a major role here. Different kinds of jewelry suit different types of faces. You need to put it on and try out, or consult a specialist to get an idea of what suits you. Another important part is budget. You must set a clear budget and then go on to choose your jewelry. The prices of jewelry touch the skies, so be prepared to spend according to your budget only. Stay away from chokers, as they can make you feel irritated. Even if you have a slender neck, it will make you uncomfortable after wearing for long. If your attire is too heavy and has lots of detailing, get simple jewelry, or it will look like you have overdone. Good Smile: This is the most important thing that makes you look really beautiful. Without a smile, the whole makeup will be incomplete. Relax, do some breathing exercises, and take it easy. Get a good smile to move on to your new life with positive energy. The wedding day is an important day for the bride. Everyone wants to look the best. These tips are sure to help you decide on your accessories. Sport your best look for the D–Day. An individual essentially make substantially articles I would personally express. This can be a very first time that My spouse and i used your web site website thereby considerably? My spouse and i stunned with the analysis you’ve made to make that set up astonishing. Excellent endeavor!